Rubber duckies were mixed in a cement mixer and then dumped into a large water tank this year due tonconcerns about Plum Creek’s high water. Children at the event picked the winning ducks. Pictured left to right: Rotarian and festival coordinator Ed Brewer, first place $2,000 cash prize winner Susan Wood, Rotarian and prize-winning ticket seller Joanie Coffee, and Rotary Club of Castle Rock president Gordon Allott. Ducky Derby mascot and Connor Lucht of Castle Rock enjoy Ducky Derby festivities. 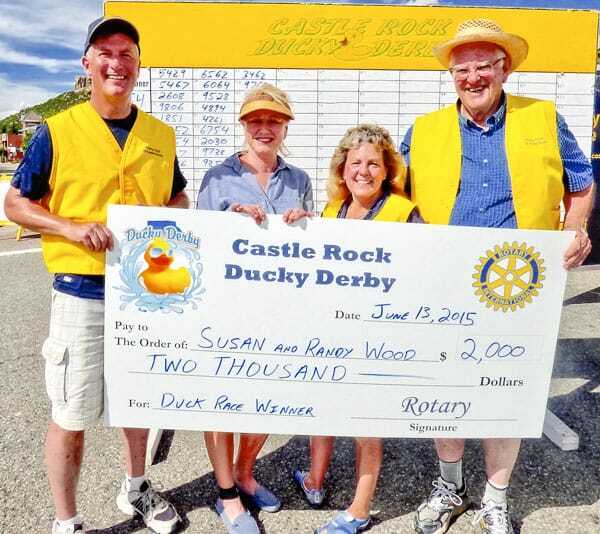 Members of the Rotary Clubs of Castle Rock and Castle Pines are celebrating the success of the 19th Annual Ducky Derby (Derby), which was held in downtown Castle Rock. With the support of 38 individual and corporate sponsors, the Rotary Clubs raised close to $48,000. This year the funds will be distributed to local non-profit organizations, including Castle Rock Senior Center, Douglas/Elbert Task Force, Guitars for Our Troops, Wellspring Community, and the Crisis Center. This year’s Derby featured live music from three different bands, a HawkQuest live birds of prey exhibit, a silent auction, martial arts demonstrations, kiddie train rides, a bounce castle, face painting, a dunk tank, food and beverages, vendor booths, the Ducky mascot and other characters, and cash and other prizes donated by local merchants. Due to concerns regarding the high waters in Plum Creek, the rubber duckies were placed in a cement mixer truck, tossed about, and then dumped into a large water tank; winning ducks were selected by children who attended the event. Although there were no winners for the $1,000,000 grand prize nor new car, Susan and Randy Wood of Castle Rock won the first place $2,000 cash prize. The Rotary Clubs of Castle Rock and Castle Pines are part of Rotary International, a world-wide humanitarian organization with more than 1.2 million members; their motto is “Service Above Self.” For more information about Rotary International or local clubs, visit www.rotary.org.